Christmastime is here, and you know what that means. It means a whole bunch of husbands who don’t know what to get their wives. I grabbed my coat and ran for the car as quick as the Roadrunner could run from Wile E. Coyote. I’ve told you about Diane Jaderholm Designs before. Dede is an amazing artist who handcrafts every piece of jewelry she sells. My favorites are the pieces she makes with antique buttons from France. So cool. So beautiful. So classic. 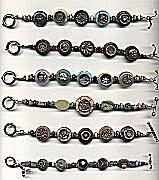 Just check out these bracelets made with buttons. I have one, and every time I wear it I get a compliment on it. But she also makes some pretty neat contemporary pieces too. You can check out many of Dede’s one-of-a-kind pieces on her website. To really appreciate Dede’s talent, you have to attend one of her shows to see her work in person. She sells her original jewelry out of her home a few times a year, and if you live in the Wheaton area, you really should go. If you don’t live in Wheaton, you’re really out of luck. For so many reasons. But you can still order from Dede online (although her website only shows a portion of what she actually sells). Or give her a call. She’ll make whatever you want. Today, because Dede’s jewelry is probably one of my Top 10 Favorite gifts ever, and because B let me pick out some pretty incredible pieces that I can show you AFTER Christmas (yes, he’s still going through with the wrapping and making me wait until Christmas to open them, even though I already know what I’m getting) . . . because of all that (did you get lost in that sentence? I did!) I am giving away one pair of Dede Jaderholm earrings. These earrings are made with sterling sliver interlocking loops with bright green and blue glass beads. So fun and spring-like. And aren’t we all needing a little hope of spring right about now? You will love these little beauties, and you can win them if you leave me a comment. 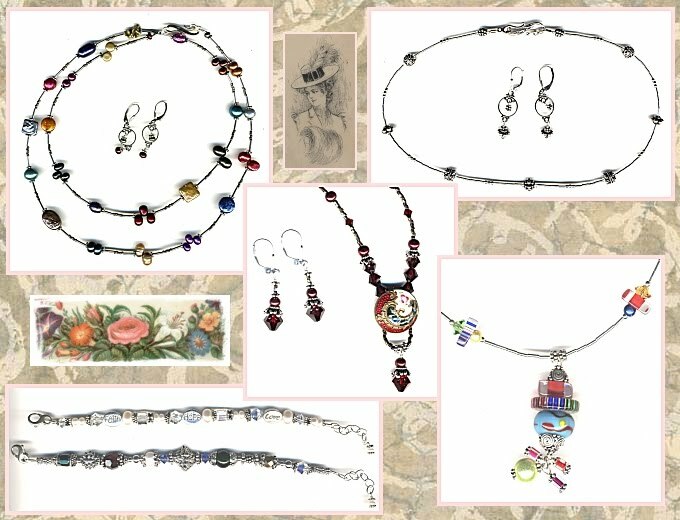 Head on over to Dede's website, take a look around at all of the beautiful pieces she makes, and come back and tell me which piece you'd like to have. And just because I love you, I’ll give you three more chances to win (leave separate comments telling me you did this). Tweet this giveaway to all your Twitter pals. Mention this giveaway on Facebook. Follow me in an RSS feed. Thank you, Shelly. You know I love your blog. And it's even funner when you're giving away free stuff! I'm a subscriber through feedreader. I am feeling oh so lucky today! 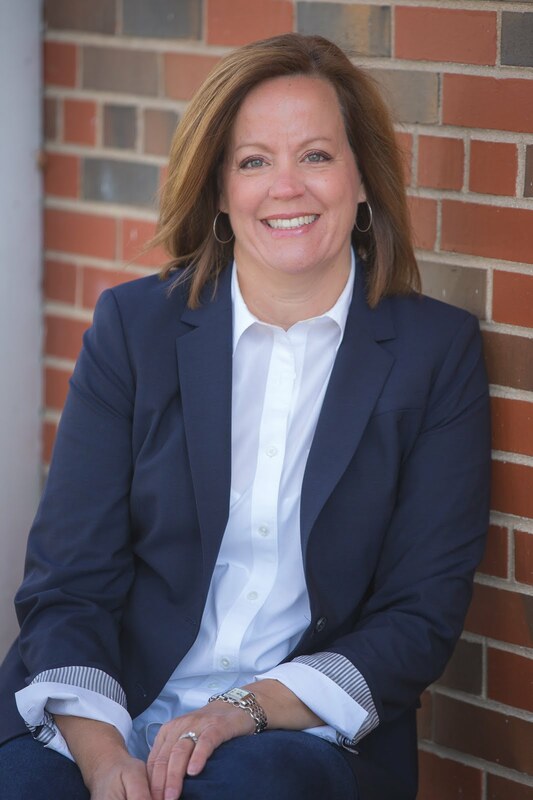 I thought to myself "I miss Shelly!" and headed over here and LOOK WHAT I FOUND! Jewelry. It's mine. Might as well close the contest and get it in the mail to me. But just to be sure, I'm tweeting and Facebooking it. Be right back. Took your tip to look at the antique buttons..Oh my goodness, I really want the Warm Eclectic Chunky Necklace,Bracelet, & Earrings. Just put it on Facebook. You know that all of us that are expecting toaster ovens and other appliances for Christmas got excited seeing this beautiful jewelry. :) I went to her site and loved the Bright Gemstones & Shells Necklace. Very cool stuff. Can't tweet; forgot my sign in password. No need to follow you on RSS feed, cause your blog is the first thing I look at every morning. Wow...it is hard to choose which one I liked best..but I think it's the inspirational bracelets. and just think, you could help me finish my christmas shopping. my sister did ask for some new earrings. and, as you already saw, i facebooked it. Well I have never seen her jewelry or been to her house. I will have to get that done this week - and maybe find something for my hubby to wrap for me! Someday I'll be able to just run over there with my spouse at the drop of a hat, or at the drop of 3 kiddos on your doorstep. Maybe that's a good reason I should win the giveaway: so you don't end up with my 3 kids while I browse DeDe's! By the way, I'm also impressed that you have high school boys following your blog. You are one cool mom! Wow, such pretty stuff. Thanks for sharing it Shelly. I really like the Blue Flower Cross Necklace & Earrings. She has so many lovely things! Tweeted to the tweeps! Thank you for hosting such a nice giveaway! I am jewelry-impaired (it appears to be genetic). 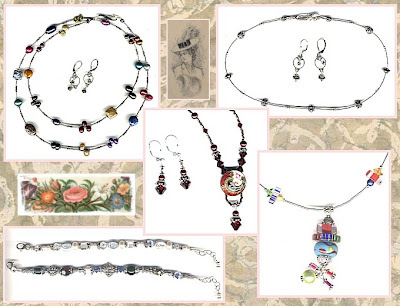 I am following your lead: I really like the Antique Austrian Tiny Button Bracelets, too. I have been thinking of a trip to Wheaton, so I may need to set aside a little spending money! It's hard to choose, they are all so pretty, but being an antique lover, I have my eye on the neat antique button bracelets - multi light colored gems. Neat to think that some of the buttons are from France! Top 10 Lines from "It's a Wonderful Life"
I'm Over at MODsquad today!